This world often seems like a crazy place, with 24 hour scrolling news, a constant connection to technology, traffic chaos and demands on our time. We need to be kinder to ourselves and to take a few minutes to unwind and seek sanctuary. One of the best ways I find to do this is a long soak in the tub, soothing both my body and mind. Now that I've switched to a non-toxic lifestyle, I look for natural ways to nourish my skin and I love to use what I can from my tiny city garden. I've been harvesting some of my flowers and herbs, drying them out in a darkened cupboard over the last couple of weeks. Lavender, chamomile, alliums, alchemilla and rosemary have all been very productive this year but others are struggling with the extreme temperatures. If you want to dry flowers; pick them when they are not wet and preferably on the morning before the sun gets too hot. Bind them with some twine and hang upside down somewhere dark. I'm using the alliums, alchemilla and some poppy seed heads I found to decorate my home, the herbs for culinary purposes and the dried lavender for this oat bath recipe. Dried lavender has many health benefits; it's calming, soothing on the skin and helps you to sleep better. Together with the heady scent of rose, this combination of healing herbs and flowers will help you to unwind and forget about your troubles (for a little while at least!). 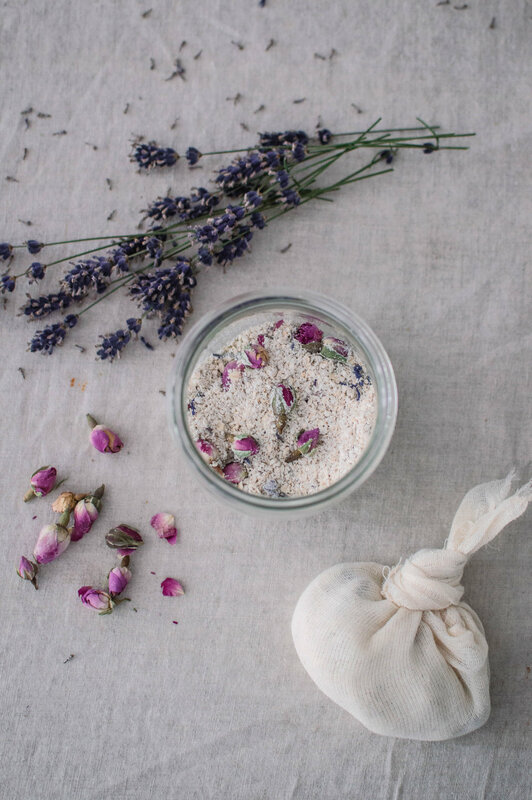 For this recipe I've used lavender from the garden and I've added some culinary rose petal buds and cornflowers flowers that I had in the cupboard. This recipe would be wonderful with dried rose petals, chamomile heads or a few drops of your favourite essential oil too. Oatmeal is soothing for itchy skin and it helps to cleanse and moisturise. I've used a cheesecloth to make the bags as you can make the ties long enough to fit over the taps and dangle in the running water. Once you have used the oat bath mix, simply rinse out the cheesecloth bag, allow to dry and then reuse it. You may also have to rinse the bath out after you've used the oats as they can leave a little residue behind. These bags make lovely zero-waste gifts for teachers or Christmas presents. Just remember to add a label with your ingredients and how to use instructions. One cheesecloth cut into squares. Blend the porridge oats in a food processor. Transfer to a bowl. Strip the dried lavender flowers into the bowl along with any other dried flowers. Mix together. In the centre of the cheesecloth square, transfer some of the oat mix. If you want to add a few drops of essential oil, do it now. Tie the bag together, aiming to leave the ties a little longer so the bags can dangle easily over the tap and in the running water.